Kenya is the quintessential safari destination and the whole package: great game, beautiful scenery and amazing culture. I was very grateful to get back to Kenya for a 6th trip (or was it 7th?!) and to really dig deep and see so much more of the country this time: 24 days and 37 properties, of which I stayed in 19 and inspected another 18. Even a year after my return, I feel strongly that my ultimate Kenya itinerary would include Sarara in the north in Namunyuk Conservancy or a camp in Laikipia, Lewa Conservancy and the Masai Mara. Sarara was wonderful for landscapes and culture, while Lewa was notable for rhino and all-around great game with no crowds! The Masai Mara is incredible for the documentary-type sightings and epic river crossings, if visiting during the peak time of July to September for the migration end. This is really a winning combination, and I want to elaborate a bit more on Sarara Camp, as our two nights there really stood out. When I arrived at Sarara, I was immediately blown away by the views as it is totally remote with mountains in the distance. Sarara is a total “Out of Africa” kind of place, and it’s wild beyond your imagination! Aside from the managers, the staff are all local Samburu, and their English is pretty basic. The food was excellent, the tents are beautiful, the views were breathtaking. Having lived my whole life in very flat Florida, any place with hills and mountains just has extra wow factor for me! I just sat one day and drank in the view from my terrace. There are two hilarious lodge dogs, both spaniels. One would sit in the shallow part of the pool with a stick in his mouth just waiting for someone to play fetch with him. There was also a kudu running around, who had been raised at the lodge. He was quite cheeky though and would wander through the main area looking for food! They also feed the birds, and hornbills come right to the little half wall of the dining area and eat. Here’s a photo of my little one, the kudu and one of the Sarara dogs all in one shot by the beautiful pool! There is also a super active water hole at the lodge just below the pool area where we saw tons of warthog, a big breeding herd of elephants and huge troops of monkeys. Sarara is the epitome of an incredibly cool multi-faceted safari camp! One can stand on the edge of the pool and look down at the animals at night safely! The activities were awesome, as they were varied and included very unique game-viewing and cultural experiences! You can walk, fly camp, visit the Reteti elephant/animal orphanage, which had a baby kudu and a gerenuk when we were there. The Samburu Singing Wells, which were the one thing I had really wanted to experience, did not disappoint. The Samburu dig their wells and sing songs, and their cattle know the songs of their owners and only drink from their well. It’s a fascinating, surreal experience that feels totally authentic, with no filming or photos allowed. We walked to the Singing Wells, and it was hot! I carried my daughter in a carrier most of the way but then we were sticking together because it was so hot. Mark, our guide, kindly offered to carry her on his shoulders, which she loved. He has two wives and ton of kids of all ages from like 18 to 4! At night the elephants come to the dry riverbed and use the wells that the Samburu had dug for their cattle during the day. It was one of the coolest things to witness, because you always hear about human/wildlife conflict but in this case the elephants were benefitting from human activity! Although baby eles often will fall in the wells, which is one of the reasons the Retiti elephant orphanage was born. We had good hyena sightings, and Sarara was the only place in the 3-week trip where we saw leopard, though it was a quick sighting right after the sun set. The leopard was using our safari vehicle to stalk dik-dik, a gorgeous small antelope that are a favorite of leopards. 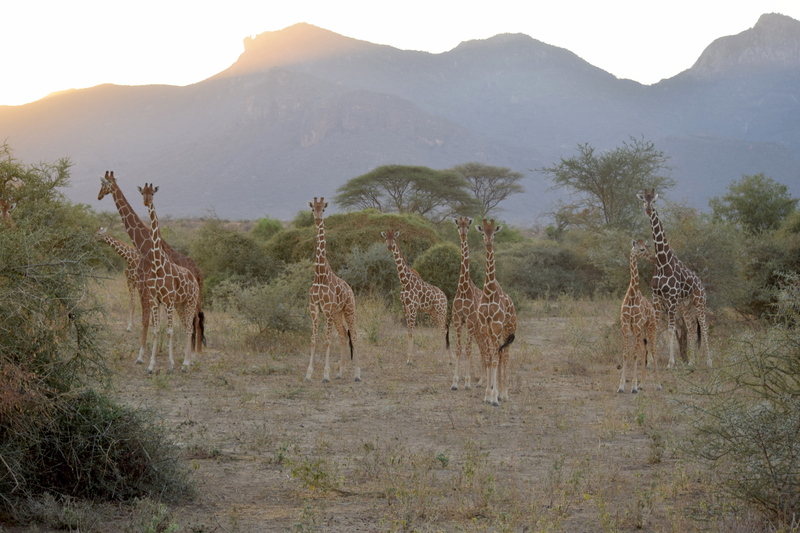 I’ve never seen so many giraffe in one place like we did here, and the sighting and photos looked Photoshopped! We sat on the top of the vehicle at a lot at sightings, and there is simply something magical about the area and the whole experience. There was a recent National Geographic story on the Reteti elephant orphanage near Sarara, photographed and written by Ami Vitale, who I saw speak in the Spring as part of the Nat Geo live series. Ami Vitale is a National Geographic photographer and Nikon ambassador. She showed the most incredible video footage and photos taken in India and East Africa, where she has spent a lot of time! She also debuted an incredibly cool Sarara video and also an India video that she did many years back, which transported me to another part of the world I adore and love to plan trips to, India and the subcontinent! After my incredible trip to Kenya, I am excited to be sending more clients to Sarara to experience the magic of that place!